TV On The Radio breaks all the rules. They are a rock band that also uses electronic sounds and elements of soul and jazz. You never know what they will do next. Jason: Welcome to English, baby! I am Jason, here with Jaleel, the drummer for TV On The Radio. Jason: I was hoping you could teach us an English phrase today, and one of your song titles on your most recent album is “Will Do.” Can you tell us about that song? Jaleel: If I said, “You wanna come over and we’ll go out and get some pizza pie?”, you’d be like, “Will do!” And then you come on over, and we go and get some pizza pie, and it’s a good time. Jason: Alright. So it’s basically something you say when you agree to something. Jason: When you agree to do something, specifically. Jaleel: Yeah, when you agree to do something. 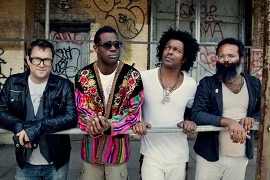 TV On The Radio recently released a song called “Will Do.” It’s surprising that a band that likes to experiment with musical styles would name a song after an idiom about following rules and agreeing to another person’s wishes. But as the band’s drummer, Jaleel Bunton, explains, the song is about agreeing to the wishes of a lover. He says it’s about aquiescence, or making no objection to what you are ordered to do. The phrase “will do” can be used in casual conversation. Jaleel gives the example of a friend calling to ask you to come over and eat pizza. You could say, “Will do!” and then come over. To learn more about Jaleel and this interview, visit our blog. i am a chiness girl !i am enlish is very terrible!i holp someone that can help me study english!thanks! I also have a comment to everybody that want to open a new english conversation for everyday free! I have found a new software for my cell phone which name is “Viber”. It is free and you can install it in Andoid, apple or pc! Afterwards if you add phone number of your freinds who are members of that application and registered before you can make a call or send a sms free! I used it and find it wicked awesome. what do you think? If you are ok with my idia give me private message to exchange number and start the new way for upgrading english speaking…. When somebody call me to go outing for view and meal , i always say :will do! when someone askes me to come over and do something crazy I’ll say “will do”! because eating new foods is my best hobby. If someone asks me to go play tennis, I will always answer “Will do”! Sometimes, I always can’t refuse to others. This can lead to a very tired, but won’t make you happy, always feel overwhelmed. If someone asks ne to help him, i will always answer “Will do”! It’s a very good expression to show that i am ready to do something for someone! It shows yhat i am very interested in doing something!